One of the most popular Birds on Tap – Roadtrips! is our annual “Fall Ducks and Draughts.” One of the original two BoT – Roadtrips! 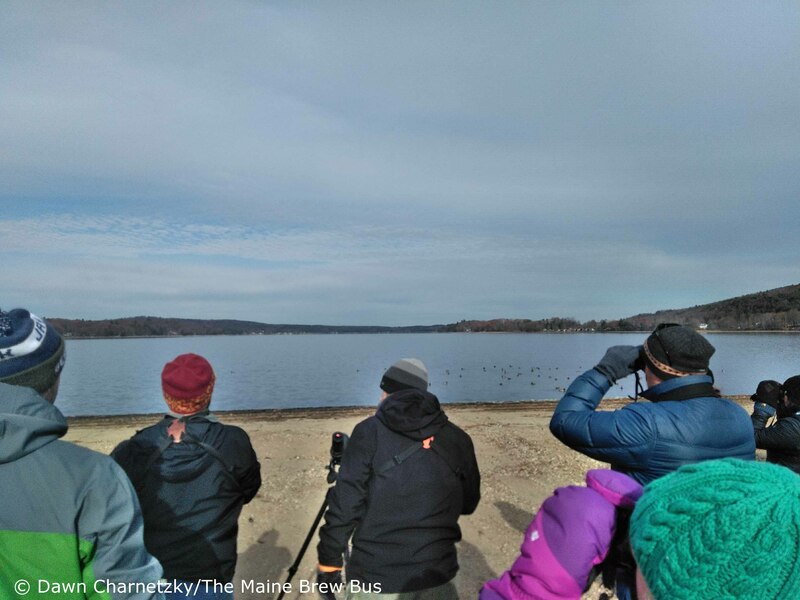 back in 2015, this popular outing visits Sabattus Pond near the peak of fall waterfowl migration with our partners, The Maine Brew Bus. It rarely disappoints, but today it far surpassed expectations! We began at the south beach, where an American Coot was a surprise. However, more surprising was the flock of shorebirds littered around the south end. While many of the 30 or so Dunlin took off and kept going, about 10 White-rumped Sandpipers returned and landed right in front of the group, no more than about 30 feet away! We were able to carefully study the progression from juvenile to 1st winter plumage, with most individuals, such as these two, mostly still in colorful juvenile plumage (with one bigger, grayer Dunlin in the background). With our focus back on waterfowl, we began to sort through the masses, starting with 6 spiffy Northern Pintails joining the Mallards nearby, while one lone female Green-winged Teal quickly paddled away. 18 Ring-necked Ducks loafed just a little further offshore, providing a good intro to the genus Aythya. Sabattus Pond is famous for its legions of Ruddy Ducks, and this cute little “stiff tail” was out in full force. We had a couple of hundred nearby, but a distant raft of many hundreds remained just a little too far to enjoy. We also began our comparison of Greater and Lesser Scaup, and took a moment to learn about the Chinese Mystery Snail that makes up a large percentage of the food source of all of the diving ducks we were here to enjoy. I had set the over/under for waterfowl species at 13.5, and our list quickly began to grow: Buffleheads, Hooded Mergansers a’plenty, but surprisingly only one Common Merganser and a mere three Canada Geese. American Black Ducks and a single hen American Wigeon made for a tally of 13 species of waterfowl; just falling short of covering the spread…in part because we never did make it to our third stop! Over at Martin’s Point Park on the southwest side of the pond, we worked the dabbling ducks and enjoyed stunning Hooded Mergansers. Then, I finally had a nice, close group of the two scaup species in perfect light to give us a lesson in how to identify this challenging species-pair. We began to walk closer, I began the lecture, and then I heard a call note from the trees that stopped me dead in my tracks. It was not a Yellow-rumped Warbler – the only expected warbler species at this season – and it’s sharp tone was very suggestive. I knew it wasn’t supposed to be here, whatever it was, and my suspicions of its identity were soon proven correct when a gorgeous Yellow-throated Warbler popped out! Sticking close to the trunk of some large Eastern White Pines, it foraged within a small mixed-species foraging flock of Black-capped Chickadees, Tufted Titmice, White-breasted Nuthatches, and Golden-crowned Kinglets before eventually disappearing towards the neighborhood. This is a real rarity in Maine, and because of the white in the front of the supercilium, we know it is of the interior subspecies albilora, and therefore not likely the result of the recent storm system. While there was unprecedented three together on Monhegan earlier in the month, this is quite the rarity, especially so far inland, and especially in Androscoggin County (I couldn’t help but wonder if there has ever been a record of this species anywhere in the county). Unfortunately, in the meantime, some fisherman came to the shoreline, and the closest scaup departed. We did have a slightly farther raft to work through, but I ended up having to employ my rudimentary artistic skills to explain how to differentiate the two species! It was truly hard to leave the pond today, and I of course couldn’t help but wonder what was around the next corner, but it was time to switch gears, turn our attention to Dawn – our driver and beer guide today – and make our way over to Baxter Brewing Company, you know, to celebrate our vagrant warbler discovery! At Baxter, housed in one of the beautifully restored mills down by the Androscoggin River, we enjoyed five samples of their most popular beers. We learned about their philosophy and history – including the noteworthy fact that they were the first 100% canning brewery in Maine – and sampled some of their best selling beers, such as Pamola pale, Tarnation lager, Per Diem stout, and the venerable Stowaway IPA. We also sampled Ceremony Green Tea IPA which surprised a lot of people and showed off the creativiTEA (sorry, I couldn’t help myself) of the brewery. We stepped outside of the brewery and were once again greeted by the local Peregrine Falcon atop the steeple of the Franco-American Heritage Center. After a few minutes of enjoying it through the scope, we hit the road, and discussed the beers we had just sampled. People’s favorites were rather evenly divided, aligning with their preferred style of beer, showing that Baxter really does offer something for everyone. We followed the Androscoggin River towards the coast, and soon arrived at Maine Beer Company. MBC needs no introduction – at least if you are into IPAs or hoppy pales – but with so many folks on the trip today from “away” and/or making their first visit to this popular destination, we started things off with none other than their Peeper – their first brew that got it all started. Spenser came out to introduce the beers and tell us all about how MBC is dedicated to “do(ing) what’s right.” And that philosophy transcends the beer. They graciously offered everyone a choice of their next samples (I of course followed Lunch with Another One) and then Spenser really rolled out the red carpet for us, taking the group on a rare behind-the-scenes tour of their brewhouse…including a sneak peek at the massive new expansion that is underway. Clearly, Spenser’s excitement was evident and the group came out of this special tour absolutely bursting with MBC enthusiasm, and lots of promises to be back soon. Thirteen species of waterfowl, many up close and personal. A most-unexpected rarity that no one in the group had seen in Maine before – and for some, a “life bird.” Urban Peregrine Falcon. Baxter Brewing Co and Maine Beer Company. Yeah, this is what Birds on Tap – Roadtrips are all about! There are still some spaces left for the 10th and final Roadtrip of 2017, “Farms and Fermentation” coming up on Sunday, December 10th. And stay tuned – we’ll soon be announcing all TWELVE BoT Roadtrips for 2018! This entry was posted in Birding in Maine, Birds on Tap - Roadtrips, Private Guiding and Tours and tagged "Birds, American Coot, Baxter Brewing, Birding, Birds on Tap, Birds on Tap - Roadtrip!, Freeport, Greater Scaup, Lesser Scaup, Lewiston, Maine Beer Company, Peregrine Falcon, Ruddy Duck, Sabattus, Sabattus Pond, The Maine Brew Bus, waterfowl, White-rumped Sandpiper, Yellow-throated Warbler on November 13, 2017 by Derek. On Monday, April 11th, Jeannette and I found a fascinating duck, clearly of the genus Aythya, at Sabattus Pond in Sabattus. Off of Martin’s Point Park in the southwest corner of the pond, it was hanging out with a mixed flock of Ring-necked Ducks and Lesser Scaup. Appropriate enough, because this bird appears to be a hybrid between Ring-necked Duck (RNDU) and one of the two scaup species! Unfortunately, it was windy, a light rain was falling, and so my phone-scoped attempts at the moderately-distant bird don’t capture this critter in all of his glory. But, they’re good enough for “documentation,” and they offer a chance to do a little analysis. 2nd from the left, with Ring-necked Ducks. With Ring-necked Ducks, Lesser Scaup, and a Bufflehead. Note the apparent size (see below). 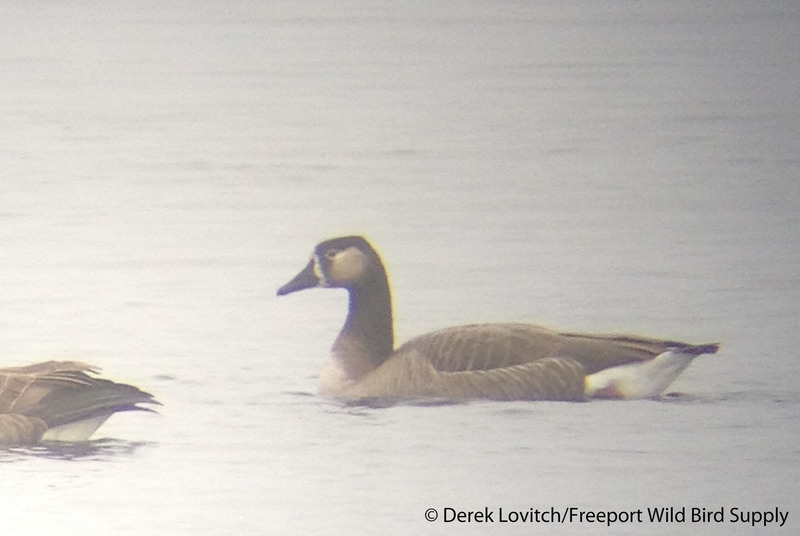 The hybrid (right), with Ring-necked Duck and overexposed Lesser Scaup. Note the dark gray back (intermediate between RNDU and scaup) and the gentle curve on the upper edge of the sides, very much like a RNDU. The sides and flanks are very pale gray, also intermediate between RNDU and breeding plumages scaup. There’s also a narrow whiter area on the front of the chest-sides, suggestive of the distinct white “spur” on the sides of RNDU. The head shape is also intermediate, with a decidedly peak-headed appearance that is closer to RNDU than either scaup, with a fairly straight nape and the peak at the rear of the head. The bill has a wide, but diffuse pale subterminal ring, suggestive of RNDU as well, but not as crisp or narrow (and no additional ring at the base of the bill). I could not see the width of the black tip at this distance, nor did I have the ability to see if there was a maroon ring around its neck (the namesake, if not very field-worthy, ring-neck of the Ring-necked Duck!). So, it’s clearly part RNDU. Whether the other half is Greater Scaup (GRSC) or Lesser Scaup (LESC), well, that is another question entirely. While RNDU x LESC are the expected species pair (in large part due to an extensively-overlapping breeding range) that Reeber calls “regular,” RNDU x GRSC have also been recorded. I never saw the spread wing, and I think a detailed and sharp photo of the wingbar could shed some light on the subject. Short of that – or preferably, a DNA analysis – we can’t say for sure, but there were two interesting observations. Note the Lesser Scaup on the left and the apparent size of the hybrid compared to it and the nearby Ring-necked Ducks. For one thing, in all lights, the head had a distinctly greenish sheen; never purple. While head color on scaup is notoriously misleading and the interpretation of it is of little value for ID in most conditions, I found it interesting that when seen side-by-side with LESC, it still always looked green as the LESC looked purple (as does RNDU). However, Reeber notes that this hybrid pairing can have a green sheen as well. Remember, not all characteristics of hybrids are necessarily intermediate. However, the one thing that was intriguing about the possibility of a GRSC as the other parent (documented, but likely exceptionally rare) is that in almost every angle, the hybrid was noticeably larger than the LESC it was occasionally with, and it usually appeared larger than the RNDUs. Unfortunately, no GRSC were present – they were all on the other side of the pond today. If this bird was indeed larger than RNDU, it’s hard to imagine that one parent was the even smaller LESC. But with a scope shaking in the wind, the play of light on light colors verses dark, and the inherent subjectivity of the judgment of size, I would not swear to it that this bird was large enough to rule out LESC as one of the two parents. Therefore, I am most comfortable with calling this a Ring-necked Duck x Scaup species hybrid. A rare and beautiful bird regardless! The hybrid (left) with Lesser Scaup and Ring-necked Duck. Reeber, Sebastien. 2015. Wildfowl of Europe, Asia, and North America. Christopher Helm: London. This entry was posted in Birding in Maine and tagged "Birds, Birding, ducks, Greater Scaup, Lesser Scaup, Ring-necked Duck, Ring-necked Duck x Scaup sp hybrid, Sabattus, Sabattus Pond, waterfowl on April 14, 2016 by Derek. Birds on Tap – Roadtrip: Ducks and Draughts! 11/15/15. The second “Birds on Tap – Roadtrip!” of 2015 was another resounding success. As a follow up to our first event in August that featured shorebirds in Scarborough Marsh, we once again partner with the Maine Brew Bus to offer a fun, bird- and beer- filled outing. Our theme for the this tour was “Ducks and Draughts,” and so we headed northwest to Sabattus Pond in Sabattus, one of the premier duck-watching sites in Maine, and arguably THE waterfowl hotspot in late fall in the southern half of the state. After pick-ups in Portland and Freeport, the bus, Paul (our driver and beer guide for the day), and I arrived at the south end of Sabattus Pond. It didn’t take long to know why this place is such a destination for birders at this time of year. A large number of ducks were immediately encountered, but we soon focused our attention on the pair of Redheads – rare, but fairly-regular migrants in Maine – that were a “Life” or “State” Bird for some. For others, it was nothing more than the pleasure of seeing this attractive bird! We covered the three primary hotspots on Sabattus Pond, amassing a total of 17 species of waterbirds. In addition to the Redheads, highlights included a Red-necked Grebe (rare in Maine’s interior), 24 American Coots, 4 Northern Pintails, 6 Green-winged Teal, and several hundred Ruddy Ducks. Although a relatively low number for here, “several hundred” Ruddy Ducks is not a statement uttered anywhere else in Maine…and especially not when proceeded by the word “low!” Other waterbirds species seen today included Lesser and Greater Scaup, Mallard, American Black Duck, Ring-billed and Herring (1) Gulls, Buffleheads, Hooded and Common Mergansers, Common Goldeneyes, and one Great Blue Heron. Sabattus also affords the opportunity to study the two scaup species together, so we took plenty of time to go over this identification challenge. Side-by-side, the major differences are often readily apparent, so we practiced our skills to apply them to a homogenous group, or worse, the “dreaded” lone, single, distant scaup! Having our fill of the nuances of Aythya identification, Paul took charge and delivered us to Lewiston’s Baxter Brewing. But as we stepped out of the bus at the renovated mill, it was back to the binoculars and scopes as we enjoyed a Peregrine Falcon pair – one busy feasting on a Rock Pigeon lunch – a top a nearby building. With that, it was beer time! A tour of the brewery and the brewing processed followed, and soon we were off – with one last quick look at the Peregrines, heading down the Androscoggin River to Freeport for a date at Maine Beer Company. Samples of Zoe (Hoppy Amber), Mo (Pale Ale), King Titus (Porter) and one of my absolute favorites, Lunch (IPA) were served, and a few folks sampled their most recent Pilot 8, their take on a Kolsch. Fueled by the delicious brews, we continued the discussion of…well, ducks…and draughts! The “Birds on Tap – Roadtrip!” series, a partnership between the Maine Brew Bus and Freeport Wild Bird Supply will continue in 2016. In fact, several new tours are in the works, which we hope to announce soon. Stay tuned! This entry was posted in Birding in Maine, Private Guiding and Tours and tagged "Birds, Baxter Brewing, Birding, Freeport, Freeport Wild Bird Supply, Greater Scaup, Lesser Scaup, Lewiston, Maine Beer Company, Maine Brew Bus, Peregrine Falcon, Redhead, Ruddy Duck, Sabattus, Sabattus Pond on November 16, 2015 by Derek. Sabattus Pond was frozen on Monday morning, as I expected, thanks to this recent bout of unseasonably cold weather. While 35 Mallards, 3 Hooded Mergansers, 2 American Black Ducks, and 1 Mallard x black duck hybrid were present in the outlet stream, this likely brings my Sabattus birding season to a close. But it is just after Sabattus’s freeze-up that LakeAuburn is its most productive. 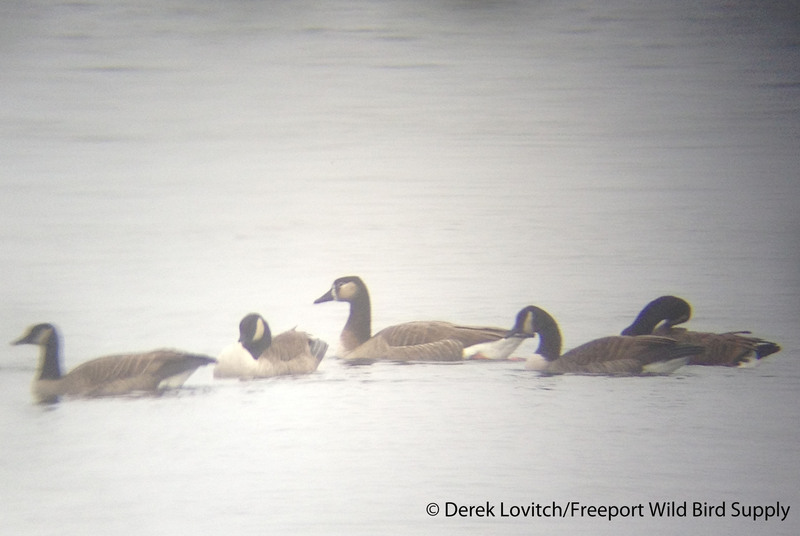 Today, 117 Canada Geese, 58 Greater Scaup, 46 Lesser Scaup, 41 Ruddy Ducks, 22 Common Goldeneyes, 8 Hooded Mergansers, 1 Bufflehead, and 1 continuing hen Black Scoter were tallied in a less-than-exhaustive search of the large lake. The Black Scoter is a great bird inland, and she’s been present for at least five weeks now. Meanwhile, among the Canada Geese, there was this funky mutt – apparently a hybrid with some sort of domestic thing. Between visiting the two lakes, I scoured Upper Street in Turner for Snowy Owls (none) or other raptors (just one Red-tailed Hawk), but I did happen upon a small flock of 35 Horned Larks that contained two Lapland Longspurs. They were feeding at the edge of Pearl Road, taking advantage of where the plow had scraped the sides of ice and snow. 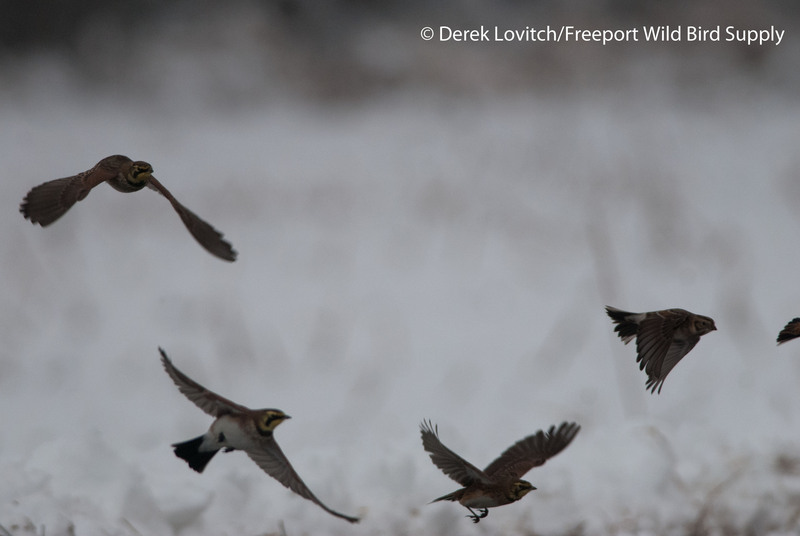 I got this lucky shot of one of the Lapland Longspurs in flight with the Horned Larks. Unfortunately, the light mist and heavy cloud cover prevented a really great shot. Sabattus Pond is one of my favorite birding locations from mid-October through freeze-up. The diversity of ducks is rarely matched in this part of Maine, and the proximity and ability to study birds (such as Lesser vs. Greater Scaup) is unsurpassed. Each fall I tell myself I needed to visit Sabattus more often, so this fall I committed to visiting once a week, beginning on 10/30 – I would have started a little earlier in the month, but the weather at the time had been so warm that waterfowl were not yet arriving en masse prior to the end of the month. I tallied all waterbirds (except for Herring and Ring-billed gulls) on each visit. I was curious to document the ebbs and flows of respective species throughout a full season here. I also hoped to find some rarities of course. Other highlights at Sabattus included a Peregrine Falcon and 40 Snow Buntings on 11/7 and 3 White-rumped and 3 Pectoral sandpipers on 11/14 (both late and noteworthy inland). Overall, it was probably only an average season at Sabattus. The only week I missed was last week, due to my schedule and Thanksgiving, which is unfortunate, as the pre-ice-up week would have provided some interesting data. There were no fallouts, and only a few unexpected (or at least, expected to be seen rarely) birds (in caps above). The Ruddy Duck numbers were well above average, but a lot of other things – especially the scaup – were average or below my high counts of recent years. And why don’t coots visit here much anymore? And really, not a single Ring-necked Duck!? Nevertheless I find it very rewarding to regularly check one location, so I thoroughly enjoyed my extra effort this year. On each visit, I also visited LakeAuburn, which is a much different body of water (deeper, sandier, and apparently without the invasive Chinese Mystery Snail that provides the sustenance for most of the birds on Sabattus). Note, however, that as the numbers of ducks decrease on Sabattus, they begin to increase on LakeAuburn – the last lake to freeze in the region. I can’t help but wonder if some of the birds on the lake on Monday would return to Sabattus if a warm spell opens the pond back up, and if it does, I am sure birds from points north might drop in as well as they are frozen out of lakes and rivers. In other words, the duck-watching season on Sabattus may not be over yet, but I think I will be turning my attention elsewhere unless it warms up dramatically. Meanwhile, on all of my visits to the two lakes, I added at least a few other stops in between in the hopes of finally finding a really “good” bird in Androscoggin County (away from Sabattus, that is). Uh…nope. My only real highlights away from the two lakes were the two Lapland Longspurs on Monday. My rarity drought in AndroscogginCounty might continue, but the waterbird watching is certainly exceptional. By the way, in a series of spring visits, I have found very, very few ducks on Sabattus Pond, for reasons unknown. Therefore, other than my annual check on Maine Maple Sunday, I’ll have to anxiously await next October! This entry was posted in Birding in Maine and tagged Androscoggin County, Auburn, Birding, ducks, Lake Auburn, migration, Sabattus, Sabattus Pond, waterbirds, waterfowl on December 4, 2013 by Derek.